Back in December I often joked that I had a tapeworm (named Tapey) whose diet was bread and cheese. So every time I ordered a grilled cheese sandwich or picked up a slice for dinner, it was all in the name of being a good host. Then came HBJ and Tapey fell on hard times. All attempts at hotbody were put on hold yesterday when I woke up before the crack of dawn to catch a train to Poughkeepsie, NY, then a short taxi ride to Hyde Park, home of the Culinary Institute of America. I've read numerous books about the CIA and going there has been my life backup plan for about 10 years. I will happily go $20,000 in debt to spend two years living on the campus and waking up at 5 a.m. to slave away in a kitchen (maybe I should have been born a century ago so that I could have lived as a prairie housewife!). The CIA offers a number of Saturday classes for "Enthusiasts," a category I fall into, well, enthusiastically. 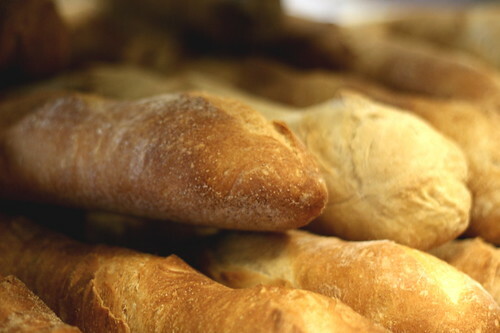 I've been drooling over the Artisan Bread class since I first noticed it about a year ago. Yesterday I took the class, which meant six hours baking as many different types of bread in a professional kitchen with Chef Jürgen Temme, who has been doing this "forever." 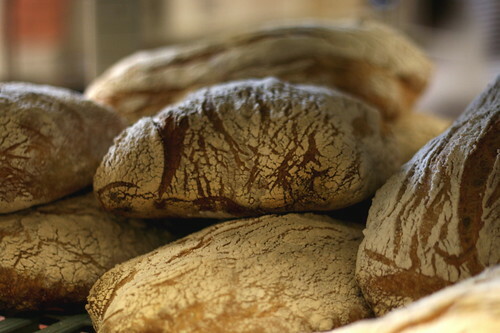 We baked sourdough, lean dough, ciabatta, focaccia, whole wheat and multi-grain loaves. I learned what a pre-ferment is, and how to make a biga and a poolish. I learned how to properly knead bread to develop the glutens, and also that if you've accurately measured your ingredients, you don't need extra flour when working with the dough. (Had Chef Temme not said this, my instinct would have incorrectly been to add more flour when I kneaded my dough.) When the chef escorted the class to lunch and said he'd stay back to bake off our loaves, I stayed behind to help him score the tops of the loaves (which, among other things, strengthens the crust's structure) and remove baked bread from the many ovens we were using. I'll be back to the CIA for a meal at some point, but who knows when I'll have an extra 45 minutes to apprentice with a professional bread baker? Lunch, then, was my focaccia - fresh from the oven, still hot and loosely wrapped in foil for transportation back to Brooklyn, eaten in the sunshine while waiting outside the CIA for my taxi back to the train station. Dinner last night was a lean sourdough loaf with goat cheese from the farmer's market, and good red wine. Both my belly and our freezer have been full of bread since I got home, and I'm already looking forward to replenishing both supplies. Tapey is happy, too. you have basically lived my perfect day. when can i come over for bread? i can bring the cheese. This is pretty much the most awesome thing I've ever heard of. So...when are you going to bake bread for us? I want to leave a comment but I'm at a loss for words. This is just so awesome. You must have been in heaven. Utter heaven. Congrats on another dream come true!